The Founding Fathers were concerned that any form of government could become too powerful. They had good cause; they just fought a long war against the greatest power of their age, ruled by a king with nearly absolute power. They wanted to prevent an executive from having unilateral ability to rule. Obama swore an oath to support that rule, but again this week he has acted as a domestic enemy to the Constitution. Today we count the number of Czars, and have another 16,000 new IRS agents needed to enforce Obama-care. This week Obama appointed administrative law makers without the constitutionally required consent of the senate. 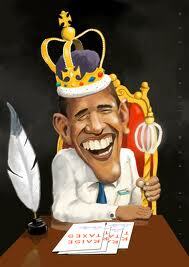 Obama is acting like the king our Founders rebelled against. Our Constitution, the law that governs government, requires his appointments to be approved by the Senate while it is in session. Even over the Christmas and New Year’s vacation the Senate was in session. Every three days it has convened to assert its powers just as the Constitution requires for a session found in Art 1, sec 5, clause 4. Remember, it is a democrat controlled senate, and it has not recessed or adjourned. Also, the Senate needs the consent of the House to recess and the House has not granted its consent. This very definite process is deliberate and important to safeguard us from unilateral actions of the executive. That doesn’t matter to the imperial president, Obama. He announced four appointments recently, claiming the power to do this as a “recess” appointment. He doesn’t care the Senate isn’t in recess. Rules, and that is what our constitution is, rules the government must abide by, rules don’t matter to the imperial president, Obama. He claimed “I have an obligation as President to do what I can without them” referring to the Senators. In others words, he couldn’t cite any authority for his actions. That’s because there isn’t any authority for his actions. He simply claimed there was urgency, a familiar thing with this administration, everything is a crisis. But appointing a bureaucrat based upon self proclaimed urgency isn’t a power granted to the President, not even when its urgent to hand out goodies to special interests to gin up support in a pending election. What Obama said was in fact exactly the opposite of the truth; it is exactly the opposite of his obligation. He has an obligation to follow the Constitution which requires the President to wait on the Senate. The President can only nominate someone, and then must wait as the Senate can make any of four choices: approve it, disapprove it, ignore it, or recess without acting. The Democrat Senate has chosen to ignore these nominations because they are too radical even for the Democrat Senate. If Reid and the Democrats had the votes to approve these radicals, they would. It is Obama’s obligation to adhere to his oath to support the Constitutional division of appointment power. This division is purposeful to prevent tyranny. But he doesn’t like having checks and balances against his power. He calls these constitutional limits to power “negative rights.” Obama’s action is precisely what the Founder’s intended to prevent. Obama’s action circumventing those checks and balances is the very definition of tyranny. Ask every Democrat running for the US Senate if they agree with Obama concerning his ability to make appointments without the consent of the Senate. The press won’t do it, you do it; attend a campaign event, ask the question: is Obama’s appointment of these four people constitutional or not? Force them to admit no President in the history of the country has ever done this. Force them to admit their party leader has broken his oath to support the Constitution. Ask them if they support that and if not what will they do about it. Don’t let them lie claiming recess appointments are common. The Senate is not in recess. Currently, only one incumbent Democrat sitting in the Senate has voiced approval of Obama’s action, and he isn’t up for re-election this cycle. The rest refuse to answer. Even the Democrats know that this is wrong and sets a dangerous precedent for an out of control executive. The last President accused of acting imperial was Nixon. He once told David Frost: when the president does something that means it’s not illegal. This week, Obama has adopted Nixon’s attitude and out done him: it’s Constitutional because the President has redefined the words of the Constitution. The Senate is in recess when the imperial President says it’s in recess. The Founders foresaw usurpation of the Constitution and gave us a remedy for it. Madison wrote in Federalist 44: “…in the last resort a remedy must be obtained from the people who can, by the election of more faithful representatives, annul the acts of the usurpers.” The Tea Party movement is that last resort remedy in action today. You are that solution. Hang on, November is coming!